I’ve never been much for eggplant. So when I found this Spicy Indian Eggplant recipe, I didn’t rush to make it right away. I figured I’d try it…eventually…but I didn’t plan to like it. Nuh-uh. Not for me. I guess I was a little jilted because the only ever time I’ve had eggplant, it was either breaded and fried or used as a replacement for chicken as Italian Eggplant Parmesan. Plus, I’ve always known that eggplant can be iffy. If you undercook it, it’s spongy. If you overcook it, it turns to icky mush. Or so I had experienced. When I was a kid, I used to hate yellow squash. That is, until my mother grew it in her garden. When I had homegrown squash for the first time, I literally asked my mother if it was the same plant. Seriously. The taste was that different! So when I saw eggplant at the farmer’s market this past Saturday, I bought some (2 for $1) and figured I’d give it another try. But how to prepare it? Out came this recipe I’d tucked away! And boy am I glad I finally got around to it! Kinda wish I’d spent $2 instead of $1! The first part of this recipe involves you slicing the eggplant into wedges, putting them in a colander, sprinkling them with sea salt and then…..WALKING AWAY. For 30 minutes. If there’s one thing I’ve learned about Indian food, it’s that it grows your patience. The secret to good Indian food is not primarily spices or ingredients. It’s TIME. I know this because when I first started cooking Indian cuisine, I used all the same ingredients that I do now, but it didn’t TASTE right. Once I started reading more about technique, I realized that all I had to do was…let that curry sauce simmer just ten more minutes…or let that chicken marinate for overnight versus 4 hours…or remember to take the time to dry roast my spices before-hand to release more of the flavor and aroma. When I first started cooking Indian food, I was newly married, taking 18+ hours in school and working. One of those semesters, I even threw an internship in there, and I took a full load each summer. Let’s just say, I wasn’t exactly brimming with free time. What I learned to do was start dinner earlier…and then walk away. Not TOO far away—the next room—but while those onions are cooking down, I’d go take some chapter notes; or while the sauce was simmering, I’d go write part of an essay that was due that week. Cooking Indian food doesn’t have to make you a slave to your kitchen. It takes more time overall, but a lot of that time can be spent doing other things while you wait on your chicken to bake or sauce to simmer or tomatoes to reduce. And OH MY is it worth the wait! Anyway, YOU’VE waited long enough for this recipe, so here goes. So you’ve sliced the eggplant, salted it, waited 30 minutes, and a lot of the bitter juices should have sweated out by now. Now, you want to rinse off the salt, squeeze out any excess water, and pat dry with paper towels. Next, throw these tomatoes into your food processor or Vitamix with garlic and ginger. Pureé and set aside for a moment. Heat coconut oil in a large, deep, heavy-based frying pan, and when hot, add as many pieces of eggplant as you can in a single layer. Cook over medium heat until brown on both sides, then transfer to a sieve so that the excess oil can drain off. If there is any excess eggplant, repeat this step until it is all done. Next, reheat the oil in the pan. There should be at least 1/4 c. left. (More is fine, too.) Add fennel seeds, cover with lid, and allow to pop for a few seconds. Carefully add the cooked eggplant so that the pieces stay whole, cover the pan, and simmer on low for about 10 minutes. Pour off any excess oil before serving. I apologize for the unfinished ending picture. I was so excited to try this dish that as soon as it was done, I scooped it up and threw it onto a plate with no regard to its presentation! The taste, however, blew me away! Why doesn’t everyone eat eggplant like this? This is surely one of the greatest ways invented! Did I mention I ate 2/3 of the entire batch in one sitting? Delicious! I’ve never really liked cooking and I just recently started. I discovered I love eggplant, thank you for this wonderful recipe. I just made it tonight and loved it. How much is a “piece of ginger?” They come in so many different sizes. I’m new to using it, so I really don’t know what size is appropriate. Thanks! I got ya! Thanks! I’m going to make this for dinner tonight. I’ll let you know how it turns out! It turned out really well! I didn’t have coconut oil so used olive oil. Not sure how that effected the final outcome. My husband loved it. It was a little spicy for me but I’m sure we’ll make it again. Thanks! I’m really excited to have found your blog as we are beginning to eat whole foods, limit processed foods, etc. It’s a whole new world but I’m loving finding tasty recipes that are healthy! I’d love to hear the story of how you found real foods. I did mine (sort of) in a video. Sadly it took pancreatic cancer to get me to seriously look at my food choices. I never thought we ate poorly but we had a lot of processed foods and didn’t pay attention to organic food. I figured it if was approved to eat, it couldn’t be that bad for us. Now that I’m fighting for my life I’m eating to fuel my body and help my immune system naturally fight my disease rather than eating to just satisfy hunger or other desires. Thanks for sharing what you’ve learned! Your video was cute & your have a great voice! It is great that your husband is being supportive! I sincerely wish you the best of luck and many blessings in your health journey! So I made your recipe and am surprised to report that it was delicious (since I usually despise eggplant). The coconut oil blended beautifully with all the other favors. I don’t care for the texture of eggplant, but I served it with brown rice, which added a nice nutty-chewy element to the dish. Unfortunately, my husband hated it. So I won’t likely make it again. Some comments on the recipe… I accidentally used a tsp each instead of a tbsp each of coriander and ground ginger, with no apparent harm done, and…yes, I did use a peach and a tomato. Yum! Oh! I used two tomatoes, not a peach. One of the tomatoes was just a different type of tomato, which was orangish-yellow. I’m really glad that you liked it! Unfortunate that your husband didn’t, but then again it IS eggplant. Haha. I think eggplant is so tricky to cook, and this is the first way I’ve ever eaten it and liked it. How did it taste with the peach? Did it have a really “peachy” flavor at all? Hope you liked the eggplant!! Anyway, the recipe is AMAZING! 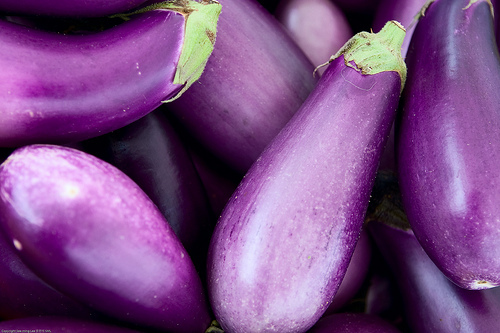 I happened to have an eggplant in the fridge and no idea how to use it when I ran across your post yesterday. Perfect timing! I’ve never used coconut oil before so I didn’t have it on hand. I used a mixture of peanut oil and ghee and only put a little to coat the bottom of the pan. Then I added more oil/ghee for the masala step. I’ll have to try coconut oil next time to see what that’s all about. I also have a TON of serrano peppers in my garden so I blended one of those (sans seeds/ribs) with the tomatoes instead of the cayenne. Even my husband, who hates zucchini, squash, and eggplant said it was really good :-) Thanks for the recipe! I personally had a very bad reaction to the aluminum in vaccines that has caused an autoimmune response in me for around 20 years. It is only through natural living, real whole foods, chiropractic care, and by eliminating toxins that I’ve been able to heal. I plan on writing a post about it, but the amount of information I would want to include is daunting, so it might be a few weeks in coming. Basically, what I thought was chronic eczema for the past two decades was actually an autoimmune response to the aluminum in vaccines. The aluminum used in vaccinations is used to give the vaccine longevity. It sticks around instead of being excreted or detoxed. And that’s the point. It’s to keep the vaccine in your body. Just like some people can be severely allergic to bee stings, I reacted very badly to the aluminum. And then it wouldn’t LEAVE. I’ve been using the Maximized Living whole body/cell detox to rid my body of aluminum, as well as eliminating all possible places where I could come in contact with aluminum (had to replace my entire kitchen, basically). The way I see it, it’s not a matter of what you’ve chosen to do in the past, but what you choose to do with the information you’ve learned and apply it to the future. Because that’s all we can do really. And that’s what I’m doing in my life.